(Heather Kelly @ CNN) Denmark's Prime Minister Helle Thorning-Schmidt snaps a selfie with British Prime Minister David Cameron and U.S. President Barack Obama during the memorial service of former South African President Nelson Mandela in Johannesburg on Tuesday, December 10. "Selfie" has been named the global word of the year by Oxford Dictionaries. Click through the gallery to see other celebrities taking selfies. There is no wrong way to take a selfie. The medium has grown into its own form of self-expression, and the artistic choices people make are as varied as the faces themselves. 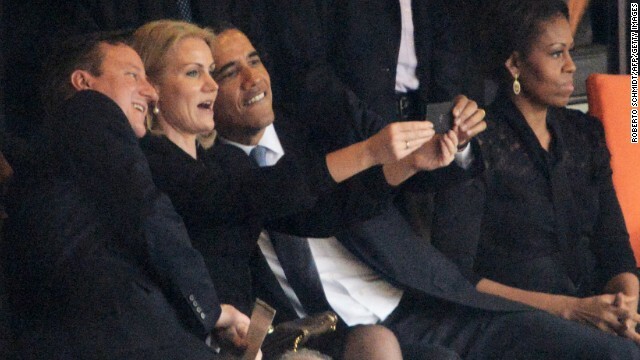 On Tuesday, President Barack Obama was photographed taking a selfie with Denmark Prime Minister Helle Thorning-Schmidt and UK Prime Minister David Cameron at a memorial service for Nelson Mandela. The incident has attracted attention and criticism, but one thing is clear: It has helped cement 2013's status as the year of the selfie. "Selfie" was named word of the year for 2013 by the Oxford Dictionary, which defines it as a self-portrait that is typically taken with a smartphone camera and posted to social media like Instagram, Twitter and Facebook. If you want to get in on the trend, here are some tips on taking the best possible selfie. Smartphone cameras are not the best cameras, but they have one major advantage that has helped them kill the point and shoot market: convenience. People always have their phones with them. To get the best possible shot out of a smartphone, use the higher resolution back-facing camera. If you are using the front camera, handy for getting the exact framing you want, make sure you tear your eyes off yourself long enough to look into the lens for the photo. If you hold the camera too close to your head you might experience some lens distortion, making your face and features look wider than they really are. Hold the camera far away from your face for the most flattering look, but be aware of that outstretched arm. If you change your posture to extend it too much, it can cause you to face the camera at a bad angle or make a straining face. Distance is also necessary if you have to use the flash. Too close and you can blow out your features, take on a sickly yellow hue, or temporarily blind yourself. Make sure you are lit from the front or the side. If you're standing in front of a bright light source, your face might be completely in the dark and the background properly exposed. If you focus on your face, the background can end up a bright white blur. You are the star of your selfie, but that doesn't mean you should ignore what's behind you. Turn around and check out your backdrop. Be aware of potentially odd intersections, like a beam or tree that would appear to be sticking out of your head. Look for potential photo bombers lurking about, or a scene that would accidentally be a bad match for your cheerful, smiling face, like a funeral procession or house fire. If you truly want your face and nothing but your face to be the focus of the shot, choose a neutral, empty background like a wall, or fill the frame with your visage. Often with selfies, the setting is the reason for the photo. Perhaps you are traveling and want to document yourself in front of the Taj Mahal or Golden Gate Bridge. Offset your face so there's room in the frame to capture the scenery. It's still a selfie if you use a tripod and timer to take the picture, which would allow you to blend in more with your surroundings. If you find yourself sitting next to someone famous like, say, the president of the United States of America, ask him if he's game to take a group selfie you can show your friends back in Denmark. When taking group shots, especially with strangers who are indulging you, always use the front-facing camera. Even though the back camera on smartphones is higher quality, it is harder to correctly compose an image without seeing the preview on the screen. You don't want to accidentally cut someone out or awkwardly have to re-take the picture. If necessary, it is acceptable to ask the President to help steady your camera. Selfies have emerged as an acceptable way to document important world events, especially ones that involve crowds. In Thailand, protesters at recent anti-government rallies posted a number of great selfies that showed a more personal angle of a larger news story. "Pig nose, giant forehead and beefy shoulder are all preventable selfie faux pas," says model and artist Gina Teichert, who is working on a series of paintings based on her selfies. She recommends making sure your head is tilted down enough that you are not getting a selfie of the inside of your nose, and not turning your head more than 30 degrees in any direction, which can cause foreshortening. Focusing too much on looking attractive can get in the way. Some people decide they look best making a particular face and stick to it religiously. (This has led to the dreaded duckface phenomenon.) Don't be afraid to put aside vanity and mix up your expressions to show different emotions, angles and crops. Some of the most interesting selfie-ographers have picked a specific style or look for their self-portraits. Spanish Instagram user Isabelitavirtual posts stunning, artistic fashion photos of herself while keeping her face from view. Palomaparrot picks vast white backdrops for her minimalist selfies. We already said mixing up your facial expressions is good, but sometimes having the exact same look in every photo can be pretty fantastic, too. Just ask Benny Winfield Jr., the self described "leader of the selfie movement." Winfield has hundreds of photos of himself sporting the exact same smile in every single shot. It is entertaining and very impressive. The theme doesn't have to be visual. Professional skater Steve Berra took a selfie every single day for 366 days. The style and setting differs from day to day; the overall product is a unique way to document a year in his life. Sometimes a specific selfie trend will sweep social media. Look out for interesting hashtags and join the fun. For example, Thursdays have become "throwback Thursdays," or #tbt, when people post photos of themselves from years gone by. Many of these are selfies, miraculously taken before the word selfie was a thing. After Gawker site Jezebel posted a rant calling selfies a cry for help, people on Twitter who argued they could be an empowering way to promote different standards of beauty started posting selfies with the hashtag #feministselfie. The #fromwhereistand tag is for people taking shots of their feet and the surrounding scene, like piles of fall leaves, sandy beaches or other interesting spots. Opinion: What's the etiquette of 'selfies' at funerals? There have been some odd and controversial selfie trends in the past year, including young folks behind the wheel taking photos with one hand while driving, or people taking shots of themselves at funerals. A high school student snapped a photo of himself standing in front of his pregnant teacher, who appeared to be going into labor. The shot quickly went viral. Some wealthy kids on Instagram post photos of themselves indulging in expensive leisure activities, like showering in champagne and jumping off yachts. They tag the images with the tag #weatlh. Take a moment to consider what's going on around you and if taking a selfie is in good taste. Also, remember all the people who will be able to see it online -- forever.